Here in the Salt Lake Valley, we do not have the best drinking water and access to healthy, pure water is very important for the health of you and your family. 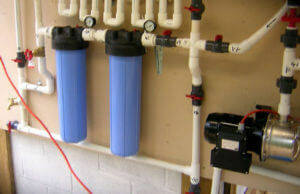 The best way to achieve this is through professional installation of a water filtration system. Water filters are the best way to provide safe, filtered water to every water tap in your home to keep you and your family safe from the harmful chemicals and pollutants and harmful protozoa, single cell creatures, that are resistant to chlorine and can cause gastrointestinal problems. Water filters have many additional benefits such as helping with dry skin, spotted glassware, high water & heating bills, bad smells, high iron content, acid water, hard water, bad tasting water and other issues, we can install a water filtration system that will work best for your situation. The water filtration process involves removing small particles like sediment, manganese, iron, chlorine and gases such as hydrogen sulfide from the water. Water runs through the filtration system which retains the contaminants as the water flows through. Chemical processes use a reaction called adsorption, in which the atomic charge of the carbon and other media causes the contaminants to abandon their bond with the water and chemically attach to the media. Call or contact us here at Keemer Plumbing today and we will provide pricing for installation of your water filtration system. Serving the West Valley, Kearns Utah metro area of the Wasatch Front!